Whether it's a business card, leaflet or brochure we can offer you a professional design service at a fixed price. Need a different size or quantity? Please contact us for a quick quote. I placed an order on Thursday. I wanted to contact you to say thank you for such a fantastic service. I received my cards the next day and I am over the moon with them and the service I received, I will certainly be using you again and will happily recommend you to friends and family. Hi, just wanted to thank you for your amazing service! When they arrived this morning i didn't believe it I shall certainly use you again and highly recommend you. Dear Sir/Madam, Received goods yesterday. Excellent all round service and product. Faster than expected. I will certainly reccomend you and use you again when required. I hope soon! Thanks everyone for all your printing help over the last year. We really appreciate all you do for us. A first rate service at every level. Fantastic service! Will definitely recommend. Thank you for the speedy and professional service! Thank you for the fast turnaround. Cards arrived today and we are very pleased with them. Hi, I just wanted to say that I received the cards earlier in the week and I am very pleased with them and would have no hesitation in recommending you or using your services again. Hi, Just a quick note to let you know that my business cards have been delivered and I am absolutely delighted with them! Thank you once again for all your help. I look forward to working with you in the future. Thank you - goods received - very pleased with the cards and presentation - thank you. Call us on 01582 410741 if you have a question. Printed in the UK using the latest equipment. 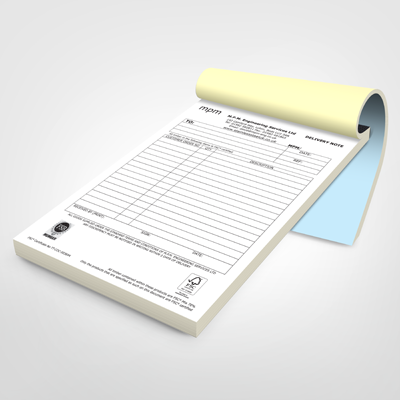 NCR Books are the affordable and effective way to make quick handwritten copies. Here at Quadrant, we supply many regular customers with high quality, No Carbon Required printing throughout the year. Once you try these superb products, you’ll never go back to using expensive, environmentally unfriendly carbon paper again. These NCR books are designed to make sure everything written in them is copied with exact, precise clarity. Given how important exactness is when writing up an order form, filling out an invoice or drafting a loan application, we know you’ll welcome anything that can help keep things accurate. Unlike carbon paper, NCR books allow you to make copies without the need for that ‘throwaway’ middle sheet. This reduces the waste created by the product by one-third, and helps keep your own carbon footprint under control. These high quality NCR books can truly be put to hundreds of uses. From applications and inspections sheets to time sheets, order forms, receipts and more, it’s a product with astounding versatility. Ordering your NCR book from Quadrant could not be easier. In fact, it can all be handled online in a few moments. Just pick the right product for you, deciding on the size and options you require, place your order and add then upload your artwork. Within five working days, we’ll have your NCR books at your address. So, what are you waiting for? Order your NCR books from Quadrant today.